The term watercolor refers to paints that are water-soluble. When using watercolors you have the full range of the paints' consistency. Use the paint right from the tube for the densest color or dilute it with water to achieve the lightest color. Load your paint brushes with these titles from our digital collections. Add life, color, texture and individuality to your work! 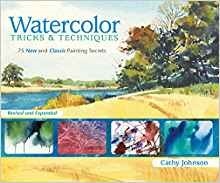 If you're ready to go beyond the basics, and see what watercolor can really do, this is the book for you! Inside, a wealth of "creative departures" will take you out of your comfort zone, making the difference between pigment on paper and original, expressive works of art. Updated and better than ever, this edition of Watercolor Tricks & Techniques features: 30+ new watercolor materials and applications along with fresh insights on many tried-and-true techniques 15 step-by-step demonstrations showing techniques in action for beautiful finished paintings 3 possibility-packed sections - Liquid Aids, Dry Helpers and Indispensable Tools - exploring the possibilities of powdered pigments, granulating mediums, liquid mask, Yupo paper and much more Whether you're an advanced beginner ready to add a little zing to your repertoire or a seasoned painter looking to push your watercolor boundaries, this book will make the journey as exciting as the final destination. 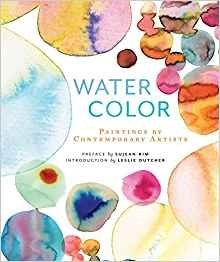 In this book, Caroline Linscott offers the perfect introduction to the exciting world of watercolor! Inside Watercolor 1, you will find an array of beautiful paintings that will inspire you to explore the medium further. Caroline covers a range of popular subjects as she introduces a number of basic art concepts and painting techniques, all clearly explained and illustrated. You will master techniques for adding texture, creating special effects, and using color to convey emotion. Then you will be ready for Watercolor 2, where you will find step-by-step demonstrations to help you further your painting skills. Watercolor—easy as A, B, C. This comprehensive, hands-on watercolor workshop features 26 core lessons, from "A" (animals) to "Z" (zeroing in on your artistic style). In between you'll find expert advice on painting an exciting range of popular subjects, including: barns, buildings clouds, eagles and other birds, flowers, glass, hills, valleys, ice and snow, landscapes, seascapes boats, people, portraits, still life, trees, cityscapes and more! 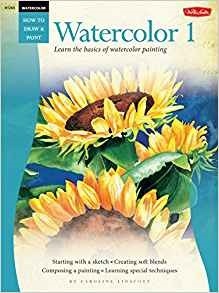 Each chapter consists of a series of step-by-step demonstrations, with special focus on key concepts (such as working from reference photos, masking, and using color and contrast) that will help you expand your watercolor repertoire. Individually, each lesson offers a stand-alone, "bite size" art session whenever you have an hour or two to devote to your painting. Together, they present a diverse "sampling" of subjects, ideas, and techniques. 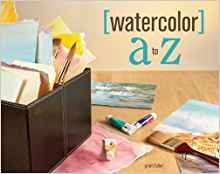 Perfect for beginning artists just starting to explore, as well as experienced artists looking to try something different, Watercolor A-Z is an engaging reference for achieving pleasing effects in watercolor, while keeping things fresh and fun.